Waist Belt Size: 27.5" - 36.5"
It has a ventral attachment point that allows a ZIGZAG or ZIGZAG PLUS mechanical Prusik to be installed with CHICANE and KNEE ASCENT accessories. The extra-wide, semi-rigid waist belt and leg loops provide comfort for the arborist. 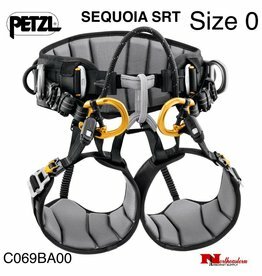 It is equipped with DOUBLEBACK PLUS self-locking buckles on the waist belt and FAST LT PLUS automatic buckles on the leg loops. The gated attachment points allow the user to easily connect a ZILLON or MICROFLIP lanyard, or to install several attachment bridges and accessories directly on the bridge. The saddle also facilitates the carrying and organizing of work tools, with multiple equipment loops and retainers for attaching CARITOOL tool holders. Saddle designed for using single-rope ascent techniques: ventral attachment point for installing a ZIGZAG or ZIGZAG PLUS mechanical Prusik with CHICANE and KNEE ASCENT accessories, and a rear buckle for installing a CROLL ventral rope clamp with SECUR shoulder straps.